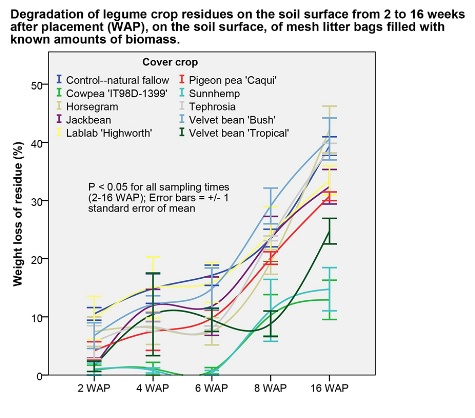 At the beginning of season 2 of a legume screening trial, there were residues on the soil surface of leguminous cover crops that were grown the previous season. The biomass of the previous season’s cover crop had been left on the soil surface. Some of it likely degraded during the dry season, but a significant amount remained. We wanted to get an idea of how quickly this residue from season 1 would degrade during season 2. To do this, we collected the biomass—a mixture of leaf and stem tissue—on 24 October, a week after season 2 legumes were planted on 16 October. The material was dried and weighed to obtain known dry weights. 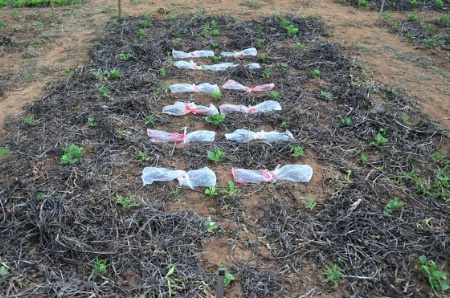 Known quantities of dry biomass were then placed in mesh bags, which were then placed on the soil surface in respective field plots on 13 November (see photo below). At predetermined intervals, mesh bags were removed from the field, and the biomass was dried and weighed. Decomposition of the biomass is indicated by percent weight loss over time (see the graph below). The rate of weight loss was quite slow from 2 to 8 weeks after placement of the mesh bags in the field. The rate increased quite a bit between 8 and 16 weeks, but the highest level of weight loss was still only 40%. From Oct through the end of March, the field received less than 400 mm rainfall. Under more humid conditions, the material may have degraded more quickly. One would expect cowpea to degrade more quickly than, say, a more woody plant like jackbean or pigeon pea. Cowpea is a fairly short-term crop, though, and much of it’s leaf tissue had probably already degraded in season 1, with mostly just stem/vine tissue remaining by the beginning of season 2. Lablab, on the other hand, is a longer-term crop, with plenty of leaf biomass at the end of the growing season; we noticed a fair amount of lablab leaf tissue that had not quite decomposed by the beginning of season 2. Recognizing the variation in rates of residue decomposition can influence decisions on cover crops to plant to maintain soil cover or control the time over which organic matter is supplied to the field.